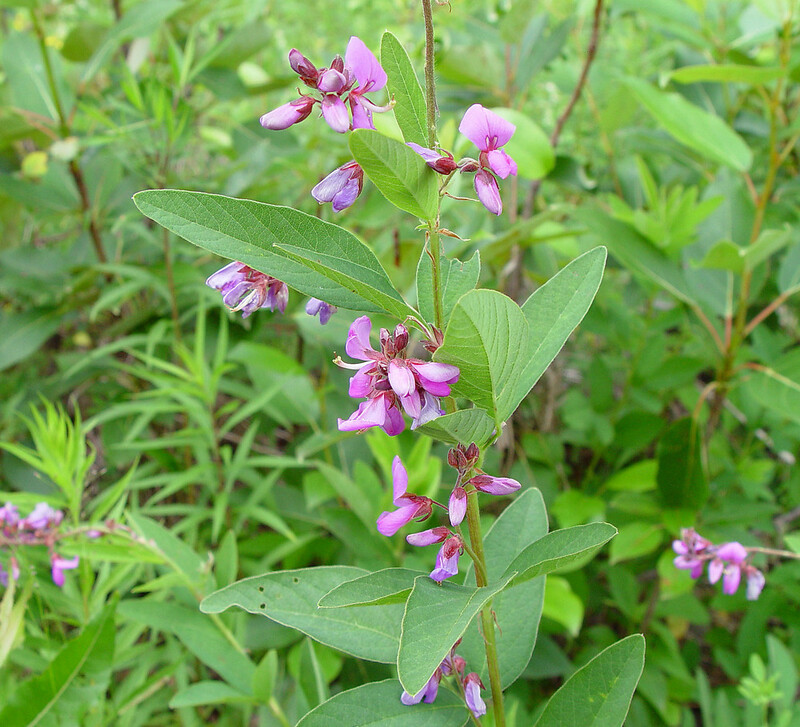 Desmodium canadense plant in bloom. By Donald Cameron. Copyright © 2018 Donald Cameron. New England Wild Flower Society. gobotany.newenglandwild.org (Accessed 2/2018). 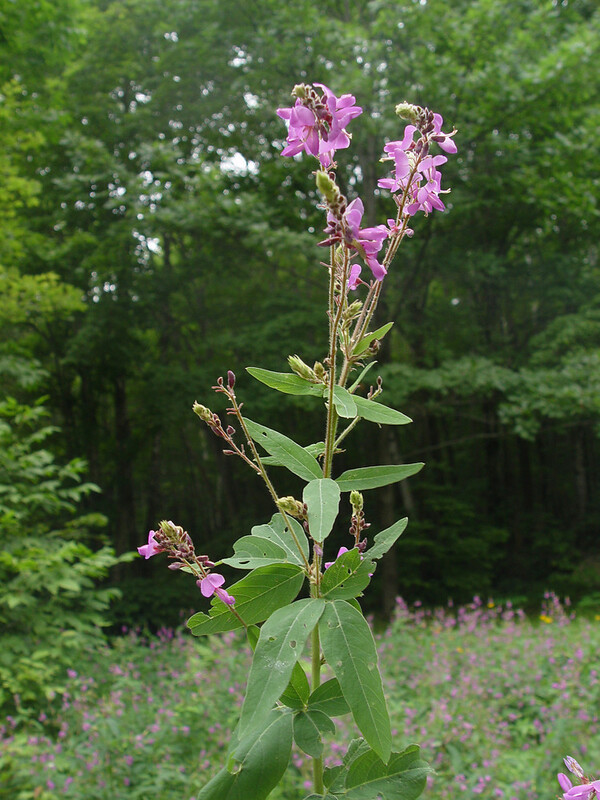 Desmodium canadense is a perennial herb, to 2 m tall, one to several stems, from a brown root, aerial stem branched above, finely hairy above; stipules 0.5-0.9 cm long. Leaves alternate, 3-parted, leaf stalk 0.2-2 cm long, stipules of leaflets 0.2-0.4 cm long, leaflet stalks (petiolules) 0.2-0.3 cm long, central leaflet 5-10 cm long, 2-3.8 cm wide, elliptic to egg-shaped, hairy below, dull green, margins entire, stalks 1-2 cm, hairy, much shorter than terminal leaflet. Desmodium canadense flowers and fruit. By Glen Mittelhauser. Copyright © 2018 Glen Mittelhauser. New England Wild Flower Society. gobotany.newenglandwild.org (Accessed 2/2018). 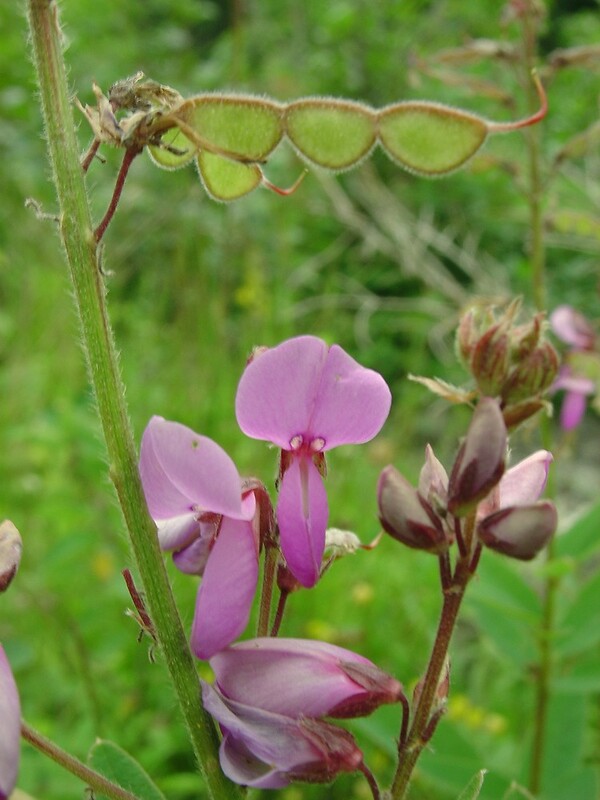 Flowers rose-purple, becoming blue, 0.8-1.3 cm long, bilaterally symmetrical, bean-flower shaped, calyx bilaterally symmetrical; inflorescence a dense raceme at top of stem ; blooms July-Aug.
Desmodium canadense fruit in winter. By Frank Bramley. Copyright © 2018 New England Wild Flower Society. gobotany.newenglandwild.org (Accessed 2/2018). Fruit dry, jointed between seeds into 1-5 segments, upper suture slightly curved, lower suture of each segment rounded, surface densely hooked-hair y, segments breaking at joints between seeds. 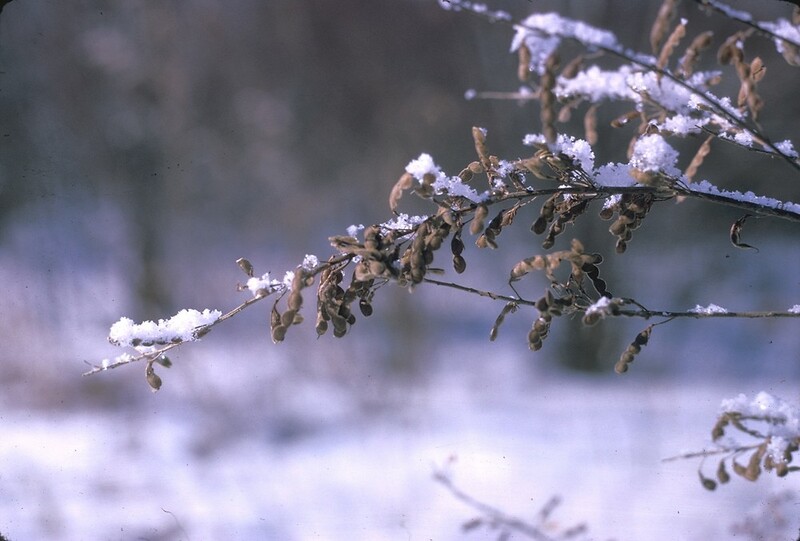 Seeds dispersed by sticking to fur or clothing (Matlack 1994), eaten by some birds and small mammals (Martin et al. 1951). Habitat: Open woods, moist soil, river banks.